This past weekend, Sunday Feb. 18, 2018 the National Basketball League (NBA) had their 67th All-Star game, producing great ratings. Which means that the event had a higher rating than before. For example, “The telecast drew a 4.3 U.S. household rating and 5.1 million household impressions – both up 2% – the best for the event since 2013, based on Nielsen Fast Nationals,” according to “NBA All-Star Game Scores In Ratings For TNT & TBS” written by Denise Petski. The shake up from the traditional match was orginally the voted All-Stars from the Eastern Conference who would play on the East team and the voted All-Stars from the Western Conference on the West team. In this midseason showcase there was a revolutionary new makeup of the teams compared to the previous traditional East vs. West matchup. This All-Star game team matchup layout was reshaped with the old school concept of a basketball pickup game. The game team names was decided base on who got the most votes in the Eastern Conference and Western Conference. In this year’s ballot the winners were LeBron James for the Eastern Conference and Stephen Curry for the Western Conference. So from them the two teams in the All-Star game was established as “Team James” and “Team Curry”. Both James and Curry were named team captains and got to select their own teammates from the all star list. This brought a more excited child-like atmosphere for this all star game. When this new excitement brought more competition and attention to detail produced an intense game this year compared to its predecessor. The year prior was more of a dunk contest then an all star game. The game’s final score last year was 192 to 182 in favor of the Western Conference and this year’s more defensive game of 148 to 145 in favor of “Team LeBron”. 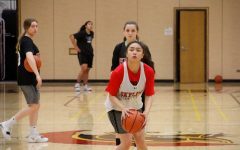 This year’s game showed more defensive strategy played by the flow of the game with each team having good runs, clearing up defects and taking leads based on quality timely defense, producing a more competitive game. The NBA should maintain this new format to boost ratings for future All-Star games.